At the invitation of State Councilor and Foreign Minister Wang Yi, Maria Fernanda Espinosa, the president-elect of the 73rd Session of the United Nations General Assembly will pay a visit to China from August 5 to 10. Q: The Swedish government says it has received a request from China to extradite one of the people who is on the Interpol red notice list. The Swedish government has not given the name, but if you look at the list the CCDI issued, it appears to be a former official who worked for a grains company in Henan, who fled originally to the US in 2011. He has two names, either Qiao Jianjun or Li Feng. Are you aware of this case? A: I am not aware of the situation you mentioned. I can check on it for you. Q: Bloomberg said that China rejects the US request to cut the Iran oil import. What's your comment? A: We have responded to similar questions many times before. China and Iran, under the precondition of not violating their respective international obligations, have maintained normal exchanges and cooperation. This is reasonable, legitimate, legal and beyond reproach. Meanwhile, China is always opposed to unilateral sanction and "long-arm jurisdiction". China's legitimate rights and interests should be upheld. This position is firm and clear. Q: On July 30, a media carried a report titled "The US Commerce Secretary Fattens His Own Wallet by Masterminding the Trade War and His Business Empire Gloats", revealing that there are conflicts of interest behind Commerce Secretary Wilbur Ross' increasing of punitive tariffs on the Chinese goods imported to the US. What is your response to it? A: I am not aware of the relevant situation. I would like to reiterate that the trade war between China and the US will produce no winner. 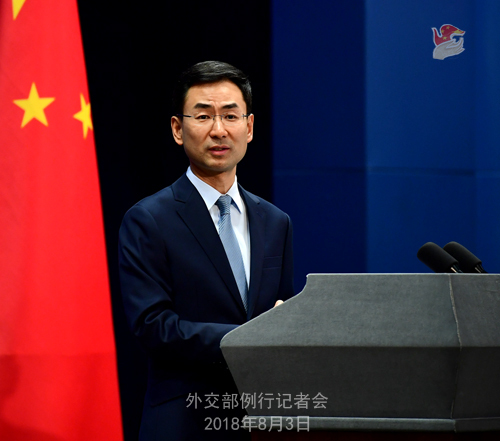 The Chinese side urges the US to come back to its senses as soon as possible, correct its mistakes and create necessary conditions for the proper settlement of the issue. Q: State Councilor and Foreign Minister Wang Yi met with his Japanese counterpart Taro Kono in Singapore yesterday. We learned from the information issued by the two sides that both China and Japan remain positive towards the improvement of bilateral relations. Can you give us more details on that? A: State Councilor and Foreign Minister Wang Yi met with his Japanese counterpart Taro Kono on the sidelines of the Foreign Ministers' Meetings on East Asia Cooperation in Singapore. We released the relevant information yesterday. China and Japan are important neighbors. China always attaches great importance to its ties with Japan. As State Councilor and Foreign Minister Wang Yi said when meeting with Foreign Minister Taro Kono yesterday, the two sides must earnestly cement the political foundation for bilateral relations, which has been enshrined in the four political documents, and properly handle sensitive issues related to history and Taiwan. This is the overarching precondition for the improvement and development of China-Japan relations. Foreign Minister Taro Kono said that the Japanese side is willing to make greater efforts to implement the consensus reached by the leaders of the two countries so as to lay the groundwork for the sustained improvement and development of China-Japan relations. We hope that the Japanese side can translate its positive remarks on its ties with China into actions, contribute more to the improvement and development of China-Japan relations and move forward our bilateral ties along the right track. Q: Did the foreign ministers of China and the DPRK hold the bilateral meeting in Singapore this afternoon? If so, can you offer us the details and what is China's expectation for it? A: Yesterday I took a similar question. With regard to State Councilor and Foreign Minister Wang Yi's bilateral meetings on the sidelines of the Foreign Ministers' Meetings on East Asia Cooperation in Singapore, we will release the relevant information in a timely manner. Please keep following it closely. Q: A US State Department official said that the Mekong River originates in China, and the Chinese dams upstream have impacted the countries downstream, so they have to manage some of those impacts. The US side announced that Secretary of State Mike Pompeo will hold the ministerial meeting on the "Lower Mekong Initiative" with five Mekong countries, namely, Myanmar, Cambodia, Thailand, Laos and Vietnam on the sidelines of the Foreign Ministers' Meetings on East Asia Cooperation. What is your comment? A: The relevant remarks of the US official are groundless and out of ulterior motives. As a country located in the upper reaches of the Mekong River, China always attaches great importance to the concerns and needs of the countries downstream, maintains close communication with them, commits itself to carrying out cooperation on water resources with relevant countries such as sharing hydrological data and flood control and drought relief. China has provided relevant countries with the hydrological data of the Lancang River during its flood season for 15 years in a row. China's hydropower cascade development in the Lancang River effectively reduces the water flow during the wet season and increases it during the dry season, which plays an important role in helping the countries downstream prevent flood and drought. The sincere assistance offered by China is highly appreciated by those countries. As to the ministerial meeting on the "Lower Mekong Initiative" chaired by the US, I want to point out that the sustainable development of the Mekong sub-region remains an arduous task and achieving the development and prosperity of the sub-region calls for the concerted efforts of all relevant parties. China welcomes non-regional countries' participation in the sub-regional development and cooperation. We hope that they can play a constructive role in promoting the development of the countries in the sub-region instead of creating divergences and hurdles. Meanwhile, we hope that all the mechanisms on the Mekong sub-region can focus on development and cooperation, jointly fuel the building of the ASEAN community as well as the regional integration process and deliver more tangible benefits to the countries and peoples in the sub-region. China will continue with its efforts to this end. Q: The Electoral Commission of Zimbabwe announced a couple of hours ago that Emmerson Mnangagwa had won the election. Has China offered its congratulations yet to him? A: I have remarked on Zimbabwe's general election these two days. What I want to say is that as a friendly country to Zimbabwe, China calls on all relevant parties to bear in mind the interests of the state and the people and respect the choice made by the Zimbabwean people. We stand ready to work with other members of the international community to maintain the peace, stability and development in Zimbabwe. Q: A follow-up on yesterday's question. It is reported that two women holding tourist visas from Russia's Republic of Buryatia arrived in Beijing on July 27. They should have been arranged to work in a restaurant. However, after they arrived in China, they were taken to a "nightclub" in Yiwu, Zhejiang and required to provide sexual services. On August 1, the Russian Consulate General in Shanghai said that the Chinese police in Yiwu have rescued the two women and now are helping them return to Russia. What is the Foreign Ministry's comment on it? A: After you raised this question yesterday, we tried to learn more information from the local competent authorities. According to the investigation by the public security organ in Zhejiang, those two Russian citizens you mentioned entered China using M visa (trade visa). They worked as performers in a bar in Yiwu, and have never been kept in captivity or forced to offer sexual services. These two persons already left for Moscow from the Shanghai Pudong International Airport on the night of August 2. I want to stress that China safeguards the legal rights and interests of foreign citizens in China in accordance with the law. In the meantime, we also ask them to abide by Chinese laws and not to engage in activities that the type of visa they hold doesn't permit. 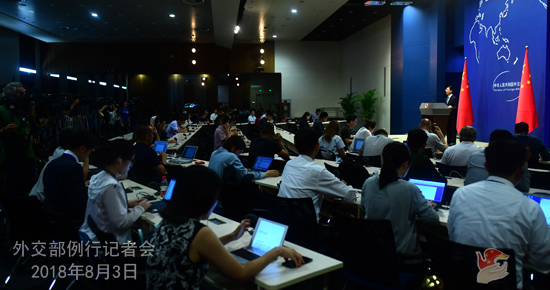 After the press conference, the following question was raised: The investigation team on the missing Malaysia Airlines Flight MH370 met with the families of the Chinese passengers onboard in Beijing today. What is your comment? Geng Shuang: We always closely follow the work related to the missing Malaysia Airlines Flight MH370. We have noted the relevant statement made by the Malaysian Minister of Transport that they will not give up searching for the plane. We hope that the Malaysian side can respect the legitimate rights of the families of the Chinese passengers onboard, take their legitimate demands seriously and continue to properly handle the follow-up matters. The regular press conference of the Ministry of Foreign Affairs will adjourn from Monday, August 6 to Friday, August 17 for the summer break and resume on Monday, August 20. During the adjournment, the Spokesperson's Office will receive your questions via telephone and fax. 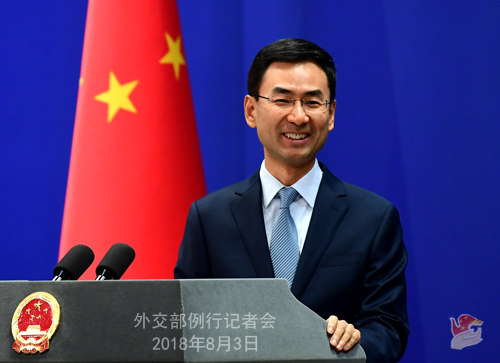 The official website of the Foreign Ministry and the WeChat official account of the Spokesperson's Office will release the Spokesperson's remarks in a timely manner. You may keep following that. Wish you a happy summer vacation!